An image of Ulises at the 2018 WAWS Scholarship Award Ceremony. Ulises was born in Jonacatepec, Mexico. He is a first generation college student attending Point Loma Nazarene University and is studying Graphic Design. In his free time, he likes helping out at Rollin' From The Heart. 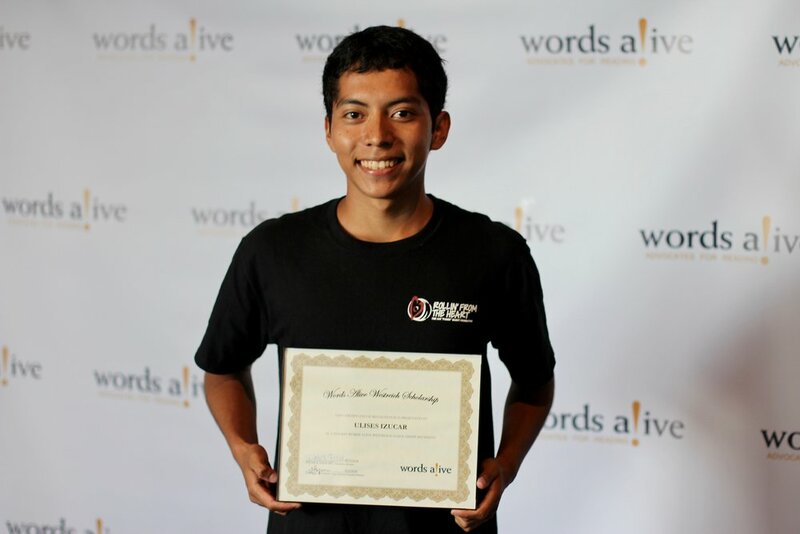 Ulises is an artist and will be debuting his work at the Words Alive Art & Literacy Event on June 5th from 6-8pm at the San Diego Art Institute. Join us in this celebration of magical things that can happen when we use books to inspire the artist in all of us! Let’s hear more from Ulises! How did you first get involved with Words Alive? I was in a the Adolescent Book Group at Monarch School. How has your experience with Words Alive affected you? Words Alive was one of the things that helped me get into reading. What have you accomplished this year that you are most proud of? Becoming a young life leader, passing macro economics, and making new friends. Further Along the Road Less Traveled. An image of Lexi (left) with our Teen Services Program Manager Jessica Fryman at the 2018 WAWS Scholarship Award Ceremony. Let’s hear more from one of our scholars: Lexi! I first got involved in Words Alive when I became a student at Monarch. Reading has always been an escape for me and after my family and I were left without a stable home when my mom divorced her abusive husband, Words Alive provided an escape for me. I loved all the books we read, the discussions, and finding out which book we were going to read next. Once again, books became an escape for me and I loved being a part of a community of open and like minded individuals. Looking back and reflecting on where I am, Words Alive has positively affected my academic career in many ways. In high school there was a time where I did not see myself going to college or making improvements to my life but the volunteers always pushed me to do my best. The books we read were stories about resilience and overcoming obstacles made by others and ourselves. They were stories that were so relatable to my own life and it made gave me the strength to discover a better life for myself. I always felt like I belonged and someone knew how to empathize with what I had been through. After I received my scholarship, I was so motivated to do better because I knew someone believed in me and I did not want to disappoint. All of the workshops that we have done have taught me life skills and my meetings with my mentor are outings that I anticipate so I can tell Sarah all of my plans and exciting news that happened that month. I am so proud of the person that I have become with the help of my Words Alive family. This year I have accomplished, with the help from Sarah, a more organized academic schedule which includes writing more in my planner, forming professional relationships with my professors, living a healthier lifestyle, and working on self-care. We made this plan in the beginning of the semester and I feel like a better person. I no longer stress too much from my heavy course-load because of how evenly distributed it is. I also have much more time to dedicate to myself and my family. What is your favorite college memory so far? My favorite college memory is transferring from San Diego City College to San Diego State University. Until a few years, higher education was not even on my radar but now I am in my dream program enjoying all the possibilities laid out in front of me and it is overwhelming in the best way. I can't even imagine where I would be had I not come to Monarch and been a part of Words Alive. I am currently reading Sharp Objects by Gillian Flynn. I watched one episode of the show and I was so enthralled by it that I wanted to read the book first. Learn more about the WAWS program here and donate today to help us keep this scholarship going! WAWS Evaluation Finding #8: "I believe in my future." A group photo of our scholars at the 2018 Words Alive Westreich Scholarship Award Ceremony. Throughout this process, we identified eight findings and then brainstormed ways we could update and improve the program based on these findings. Here is the eighth and final finding! "I believe in my future." 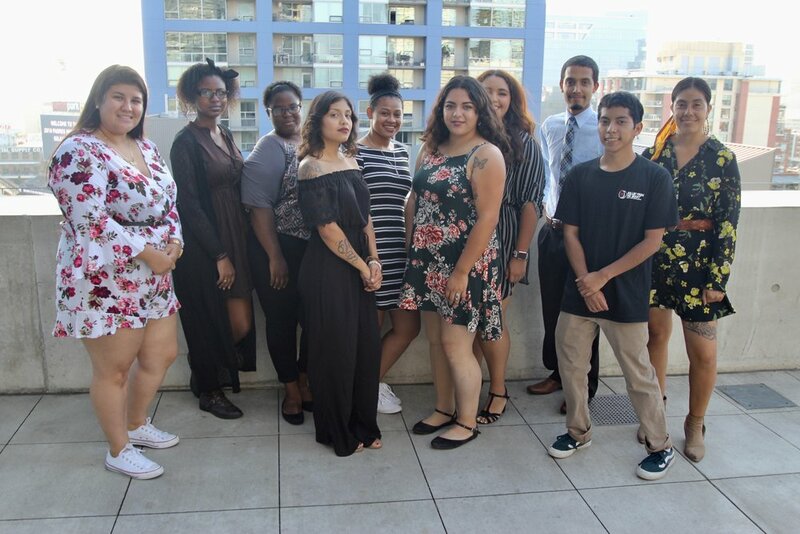 All scholars in the program are graduates of Juvenile Court & Community Schools, which serves a student body experiencing extraordinary challenges such as juvenile delinquency, homelessness, community violence and/or teen parenting. Because of this, they are often focused on the present, getting through day-by-day and making sure their basic, immediate needs are met. Through our interviews with participants and mentors, we found that many of the scholars made clear connections between participating in the program and a discovered or renewed focus on their future. In fact, 92% of the students said they now feel more hopeful about their education and future. Due to the extraordinary circumstances these students come from, scholars often felt as if they were not in control of their own lives but were instead trapped by their upbringing and environment. However, we found that after participating in the program, the financial, mentor and professional development aspects of the program have helped scholars believe in themselves, their futures and their abilities — creating a sense of agency over their personal and academic trajectory. This translates to students taking action toward improving their future. At Words Alive, we want participants in all of our programs to become advocates for themselves and their future, especially so in the WAWS program. This finding indicates that through program participation, scholars are learning to proactively contribute to their own personal development by creating long-term goals and that they’re making steps towards meeting them. This is not only significant to the individual student but to the larger community. By becoming individuals who are no longer just getting by day-by-day, they are prepared to contribute to local economies, culture, politics, and to help their communities thrive. Learn more about the Words Alive Westreich Scholarship here! An image of three of our scholars, Zaphire, Domminiece, and Lexi, standing together at the 2018 Words Alive Westreich Scholarship Award Ceremony. Throughout this process, we identified eight findings and then brainstormed ways we could update and improve the program based on these findings. Here is the seventh finding! We were surprised to find that through participating in the program and developing a relationship with their mentors, our scholars in turn became mentors for their peers. When asked what they were passionate about, six out of nine of the scholars interviewed said “helping people.” Many of the scholars are pursuing careers such as social work, therapy, and child development with the ultimate goal of helping youth that have similar stories to their own. One of our intended impacts for this program is that scholars form healthy and meaningful relationships with their peers and adults. Because of their upbringing, many of our scholars lack healthy adult relationships in their lives. To see the students develop relationship-building skills and then become a mentoring force in their community is significant because it proves that the scholars can learn the basic tenets of a healthy relationship and give and take in positive ways in those relationships. An image of Alicia and her mentor Kerrie standing in front of a sign for Every Brilliant Thing, a play that they went to see together. We’d like to introduce you to another one of our incredible scholars! Alicia is in her second year at San Diego City College studying biology. In addition to being a star student she is a star athlete and a member of the San Diego City College Lady Knights basketball team. Let’s hear more from Alicia! I first involved with Words Alive when I was in high school at Monarch. I was in the Adolescent Book Group. It's been great. I love the support I get from my mentor. I enjoy the activities they have for us. I got good grades in college. I made it through my first year of college and am now working on my second. Tell us about your favorite college memory. In my English class, I had to write a paper on this book I was reading and it was honestly the best book book. Another one of my favorite memories was being apart of my basketball team, they are so great. An image of our scholarship students and mentors at a volunteer day at Kitchens for Good. Throughout this process, we identified eight findings and then brainstormed ways we could update and improve the program based on these findings. Here is the sixth finding! 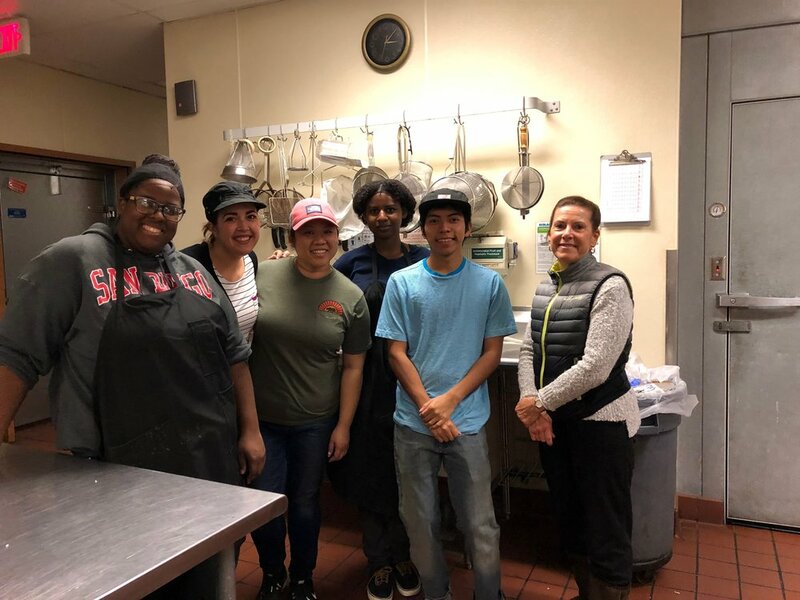 The WAWS program also provides opportunities for scholars to participate in group activities in order to make deeper connections within their cohort and experience new things in the community. These activities, beyond the mandated workshop participation, include volunteerism, meal-sharing, outings to sporting events or performing arts shows and an extension of the Adolescent Book Group designed specifically for them. As scholars begin to experience new environments, they find that their personal backgrounds can be dramatically different from many of their peers, making a sense of “belonging” and connection with others difficult. However, by spending time with one another during designed activities in the program, scholars got to know each other better, and in time, relate. Many of the students participating in the program recognized an elevated awareness of the peer relationships within the group – other young people who have shared experiences and whose camaraderie can provide a sense of safety and mutual well-being. In addition to developing like-minded peer relationships within the WAWS group, and then feeling confident to seek out those relationships and support systems beyond the group, the students also expressed an increased level of “community engagement” – a new level of ease with networking, finding resources, giving back and being a resource for each other. No one wants to feel alone, that their experiences, especially traumatic, are isolated, or that no one else understands their path. That the WAWS program is designed to meet the needs of students and young people sharing very particular and specific backgrounds is unique, and one that the students clearly have been able to capitalize. Additionally, as the young people who participate in the program progress, they have found it not only helpful to their peers, but also beneficial to themselves, to be able to recognize the value of these peer relationships and both use them to seek assistance and provide leadership when appropriate. Our WAWS student Antonise (left) and her mentor Brittany volunteered together for the local humane society. Raise awareness of mentoring in its various forms. Recruit individuals to mentor, especially in programs that have waiting lists of young people. Promote the rapid growth of mentoring by recruiting organizations to engage their constituents in mentoring. Celebrating its 17th year, the campaign has gained support from Barack Obama, Maya Angelou, Harvard, and the NBA, among others. Students who meet regularly with their mentors are less likely than their peers to skip school. Words Alive analyzed results from the mentorships in our Westreich Scholarship program and found that there was a large benefit when mentors and mentees met consistently. Many mentors mentioned that in the beginning of the program they would be stood up on multiple occasions or meetings would be cancelled without explanation. It was up to these mentors set and communicate expectations. 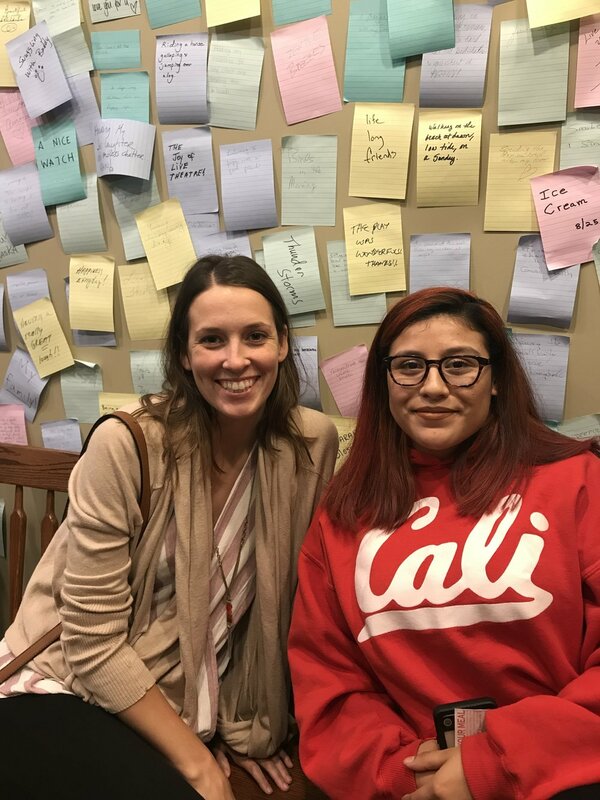 For many of our scholars, consistency was not prioritized in their previous relationships, and their Words Alive mentors helped them see the value and importance of honoring their commitments. We have many more success stories from the WAWS program that we are proud to share. At a recent meetup, our WAWS mentors talked about the successes they’ve had with their scholars. Successes included “Scholar is forming a study group”, “Scholar’s professor praised him on his critical thinking skills” and “developed a budget”. Successes like these show the amount of trust and support that the mentor relationship requires. Another success story involves Antonise Stewart, a veterinary student, who met with her mentor to donate their time towards creating kitten toys and scratching posts for the local humane society. By volunteering together, they are bonding over a shared passion and activity that makes both feel good about how they spent their time. If you would like to learn more about the WAWS program, click here. An image of scholar Alicia with her mentor, Keri. They are sitting in front of a wall full of posit-it notes. Throughout this process, we identified eight findings and then brainstormed ways we could update and improve the program based on these findings. Here is the fourth finding! Conversely, students with long-distance mentors struggled to form an attachment to them. Scholars and mentors alike reported awkward Skype interactions and missed phone calls. Simply put: Without having to look someone in the eye, it’s easier to flake. These factors made it difficult to build rapport, resulting in relationships that hinged solely on obligation. Trust is the fundamental building block of all successful relationships – and the mentor/mentee relationship is no different. But trust is built over time and difficult to establish in a phone call. Without that element of trust and essentially, rapport, mentees have difficulty opening up, asking for help or placing value on the resources offered. On the flip side, mentors feel like they are prying or stepping out of bounds when trying to follow up or hold their mentee accountable. This finding indicated that impactful mentorships underwent a period of relationship-building first – and that happens best face-to-face.